The Beauty Scoop: Win Your Battle Against Dry Skin! During the winter, for a lot of people, it is a constant battle with dry and/or itchy skin. Many people may normally not have dry skin, but are now temporarily plagued with it. I am one of these people. When it comes to the winter, I was lost for many years as to how to get the dry and itchy skin under control. I have found two lines of products from Bioelements and Avene that have helped to overcome dry skin. I would suggest to start off with a kit. 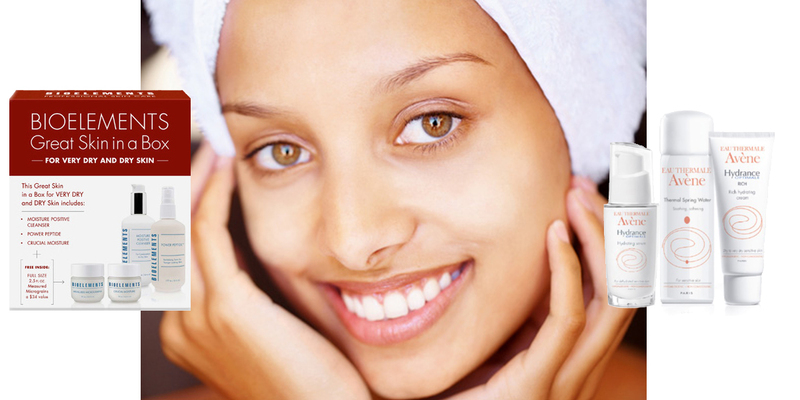 Kits are a great way to give a whole, basic regimen of skincare products for your needs. It can be challenging to figure out which products work best with each other and can get very overwhelming. The Bioelements Great Skin in a Box Starter Kit - Very Dry and Dry Skin includes Moisture Positive Cleanser, Power Peptide Revitalizing Toner Spray, Crucial Moisture, and Measured Micrograins (a gentle cleanser, spritz of moisture, creamy moisturizer and an excellent exfoliate). The combination of products in this kit gently removes dead skin cells while hydrating and relieving skin from irritation. It also smooths skin by reducing fine lines. Another great kit to kick the dry out of your skin is the Avene Revitalizing Hydration Kit. This kit is great for dry skin along with very sensitive skin. This kit includes Hydrance Optimale Rich Hydrating Cream, Hydrance Optimale Hydrating Serum, and Avene Thermal Spring Water (a moisturizing cream, hydrating serum, and a spritz of moisture). This kit delivers long-lasting hydration while it reduces redness and unmistakable signs of early aging. Both of these kits are wonderful with clearing up the winter drought and to end the season with a little holiday hydration. If you have dry to severely dry skin, take a look at these kits, along with the individual products. What skin concerns do you encounter in the winter and spring? Let us know how we can help!